If you miss a week because, let's face it, life does that sometimes...It's no big deal. You are usually given a few extra weeks at the conclusion of the study to finish. You can do it at your own pace. With summer coming and two small children, I need flexibility with my schedule to keep them entertained...but I like doing bible studies to keep myself grounded with God in my heart and mind. 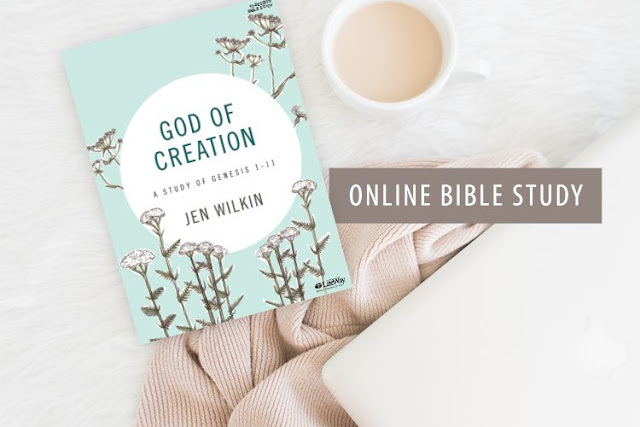 God of Creation Bible Study Sign Up! The book is actually on sale right now for less than $8.00! You can click the link to get the book mailed to you off the sign up page above. That's what I did and if you order it today - you'll get it in plenty of time before the first lesson starts! I'm excited to start this study! My book is ordered and my email has been added to their list for the video lessons...I'm set! It's a 10 week study and a great way to stay plugged in to what God is doing in your life and learning about God during a time that is usually the "off" time for small groups to meet. I'm wondering if there any followers/readers that would like to add discussions of this bible study to the blog page...Comment below and if so, I'll create a page for us to discuss this bible study as we follow it through. I would really enjoy that. Right now, I have a couple of friends who do the online studies with me and we enjoy our discussions, but we would like to add more people to the discussions. ENJOY! I know I will!